Lambert here: First, I apologize for a missing original post; I was “waist deep in the Big Muddy” of another worksheet on the mid-terms, when I discovered that Inside Elections had expanded the electoral map, and I hadn’t budgeted nearly enough time to handle that. And, it being Memorial Day, by the time I finished the post, you all would have gone off to throw the shrimp on the barbie, or whatever it is that you do. So here is a cross-post, in lieu. Writing on “volatility voters” in the 2016 elctions, Chris Arnade commented: “The elites loathe volatility. Because, the upside is limited, but the downside isn’t. In option language, they are in the money.” Steve Roth shows how in the money they really are. By Steve Roth, who serves as Publisher of Evonomics. He is a Seattle-based serial entrepreneur, and a student of economics and evolution. Originally published at Evonomics. This entry was posted in Guest Post on May 28, 2018 by Lambert Strether. The boomers were sure born at the right time, weren’t they? “First generation ever?” Hardly. Throughout most of history, inherited wealth dwarfs earned wealth. 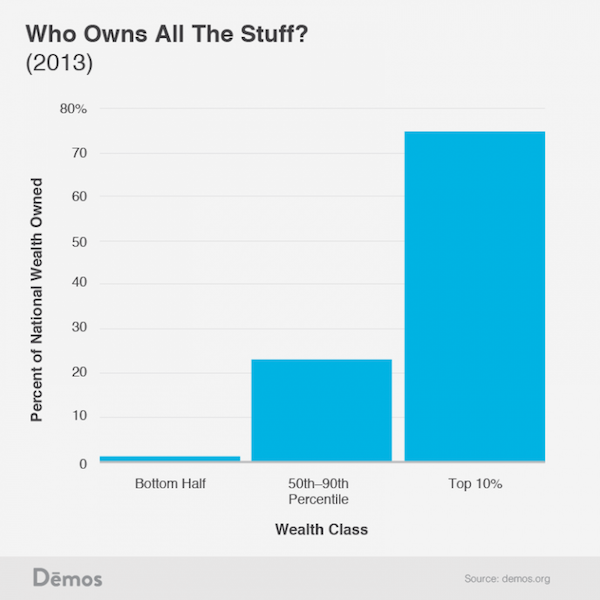 I have come to the conclusion that it is the post-war economic expansion that is the exception to the rule that the wealthy and powerful tend to hog all the money. I really believe that the great depression and the world war that it spawned convinced a generation of 1%ers that they have to share some of their bread with the oarsmen if they want to keep off of the rocks. wages and salaries are just over half…employer contributions to pensions, et al are another 12%…but transfer payments like unemployment comp and social security are another 17%; is steve counting those? I received some hysterical criticisms from my Henry-George friends saying, “That’s not ‘capital’; it’s land.” And my colleague Dirk Bessemer (from Groningen – -where the chart comes from) and I are segregating the FIRE sector as real estate, insurance monopolies and finance, not industrial capital. It’s important to show that finance and the rest of the FIRE sector have antithetical interests to industrial capital. (See Marx, Capital, Vol. III). Your Henry George friends are right. Not separating natural resources from artificial capital was a fundamental error of BOTH capitalist and Marxist economics. Actually, it wasn’t an error; it was propaganda for the merchant classes vs. the landowners. Why Marx repeated it escapes me. I’m not sure about the practical distinction between natural resources and artificial capital in the case of most actual land today. It seems to me that it’s a distinction that only makes sense in terms of say, undeveloped oil fields or the like. Most actual land in use has been worked on extensively. Capital is created and consumed in the real economy, the FIRE brigade just insert themselves at every gateway and bottleneck in that process so as to extract a toll. capital seems to mean financial capital these days. You’ll have to say “real capital” when you mean old school. Agreed. Much of the economic vocabulary has been euphemized by the financial types. “Capital” today is no longer real capital, it’s another word for credit. “Money” is no longer a legal claim on a real capital asset. It’s another word for credit. “Your money is safe in the bank” actually means “you have an ownership interest in zero-interest short-term junior subordinated bank debt”. “Bail-ins” means “your money is no longer safe in the bank”. People no longer make loans to earn interest, they “buy bonds”. Making it seem like a purchase obscures your responsibility to lend wisely and ethically. “Prime money market fund” means “loans to TBTF banks”. “Corporate bond fund” means “loans to TBTF banks”. Every time I read a summary of what’s in one of these funds, I never see a significant fraction of bonds of actual production-side corporations. Why is that? And then most issues under discussion have implicit pro-financial bias simply from the choice of terms that are in use. even the most business friendly got squat. Read and remember, and act sccordingly! 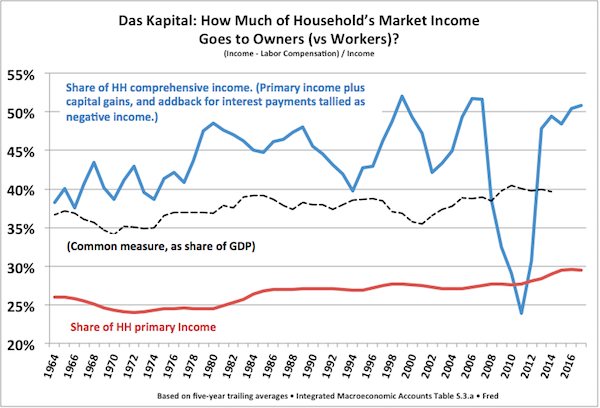 What percentage of labor income goes to Capital Income as rent or interest? Really glad to see this here. For want of a nail, the battle was lost. 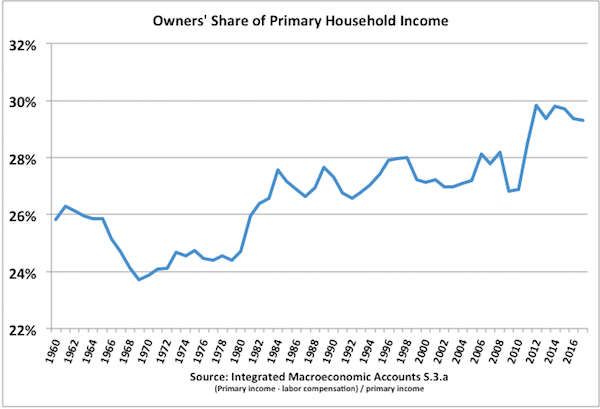 The ‘nail’, it now appears, being the failure to correctly diagnose and accurately analyze labor as a share (portion) of household income. Sincerely hope that Mr Roth will be in town and able to attend the Seattle meetup on 19 July, place to be determined.